Throw out that packaged cake mix and meet essayist, ecologist and ethnobotanist Gary Nabhan, who talks with Ketzel about living the sweet life of locally grown food. Though I didn't have the pleasure of meeting Gary Nabhan, after reading his book, I envied him. Not simply his ability to write, but his knack for creating and connecting a vast human community. And not merely a community of geographically convenient friends and colleagues, but of disparate human beings with whom he shares a profound, almost religious sense of place. For Nabhan, that sense of place begins with local food. What a simple recipe for rooting one's life! Yet for those of us who eat our morning cereal out of boxes, our lunches from cuplets of yogurt, and our dinners -- albeit organic ones -- from the frozen foods aisle, truly local food seems impossibly exotic, and its acquisition, an enormous and tiresome chore. But weigh that against what Nabhan gained from knowing the people who produced much of his food -- the family that made his mesquite tortillas, the woman who raised his duck eggs -- and the food (which for many of us, myself included, is simply fodder) becomes the staff if not the very meaning of life. Food movements abound that celebrate the idea of eating locally and eating well. Here are some links for those of you who are new to the idea, or for you enlightened folks who are hungry for more. 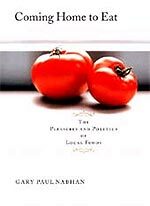 I've borrowed these links from Nabhan's book, which offers a comprehensive list of sustainable food organizations.  Community Supported Agriculture: A clearinghouse of info about CSA's in the USA.  Local Harvest: An incredibly useful tool for locating farms in your area.  Native Seeds/SEARCH: Seed saving from the American SW and NW Mexico; the organization co-founded by Nabhan.  Seed Savers Exchange: One of the oldest, dating from 1975, which continues to save heirloom seeds of fruits, vegetables, bulbs and flowers.  Slow Food U.S.A.: A movement for the protection of the right to taste. 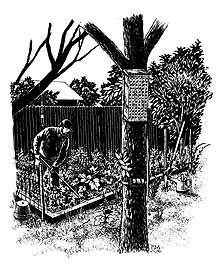 From The Forgotten Pollinators, an etching of Nabhan working in his garden.